With the refined look of linen, these elegant light gray linen weave paper covers will add a classic finish to any presentation. Our light gray linen weave covers are made from an 80lb cover stock with a linen finish. These light gray covers are perfect for use with any popular binding style (see list below), though we do offer these covers pre-punched (simply choose your preferred punching pattern in the drop-down menu above). Our window covers have a 1.75" x 4" window that is centered on the front cover 3" from the top edge. Take care in choosing the right cover for your needs as we offer close to 150 different colors and sizes of the linen weave variety. Shipped fast and worked great! Versatile, durable, printable ... what could be better for cover stock? Color was great. 2nd year to purchase for company reports. Same item but the ones purchased last year I could print more than one at a time. This year I could not. Printing more than one, the color was messed up. Not sure if it's the covers or our printer causing the problem...that's way the 4 stars instead of 5. These covers have been a staple of our office binding needs for the last several years. We have found them to be consistently the best value for our professional reports, and would highly recommend them to other small / mid-sized offices with periodic report binding needs. 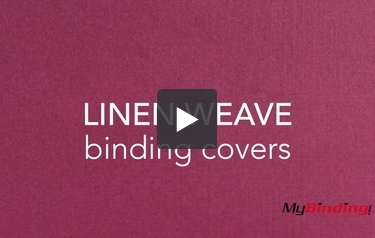 Linen Weave Presentation Covers Review by Barbara F.
This paper is strong and looks very professional. The one thing you may wish to do before purchasing the paper is to get a sample in-hand. The color we purchased is "Light Gray" but it is very dark. Otherwise, we are very pleased with the quality of the product.